We are Carol and Wayne and Eddie. Here are some numbers for our 2012 Bahamas trip on FLUKE. This was our longest Bahamas trip yet in both days and miles. The fuel usage numbers include the hours running the generator, primarily to recharge the batteries, but sometimes for cooking or laundry. This trip had a lot of rainy days that hurt the effectivity of the solar panels, but when the sun was out it was high in the sky and the panels cranked out a lot of amps. It was our most efficient Bahamas trip. The MPG numbers would be higher without the generator. One thing I thought interesting was to compare this trip with 2011 trip to Canada. In the Bahamas we tend to spend more time at each stop. In 2011 we averaged 24.7 miles per day and this year we averaged 17 miles per day. As usual, we did not spend any nights at the dock in the Bahamas. We did spend many more nights on moorings due to the weather that caused us to divert to Stuart and to stay at Hope Town twice. Moorings in the Bahamas were $20 per night. We have been waiting since we got back from the Bahamas to get the boat hauled out of the water for hurricane season. The storage yards in Ft Pierce are both packed, but we finally got hauled out at Riverside Marina and Boatworks in Ft Pierce, where we were 2 years ago. Glad to have that out of the way even though the hurricane season is half over and seems to have slowed down, but it only takes one. We have a long list of mostly minor things to do on FLUKE while she is out. I recently discovered Tripline while reading another Kadey Krogen owner's blog (Muddy Waters). I have made maps before using google but this looked much better and was very easy. I used it to create the following Map Player and Place List. If you click on the play button near the top right on the following map, it will play. Enjoy the music! You can also click on "FULL SCREEN". The next section is a scrollable list of the same stuff as in the map player, but you can scroll at your own pace (and no music). Click on pics to expand into slide show. In the last post I said that we had dropped the anchor in Wells Bay. 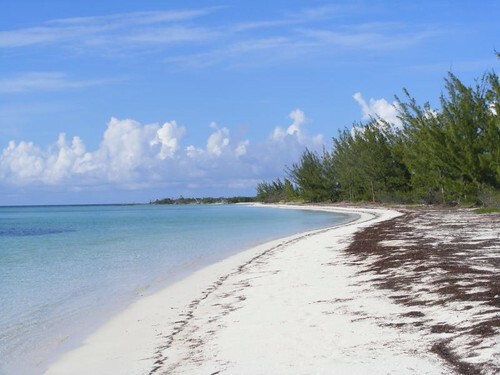 Wells Bay is adjacent to Grand Cay, Little Grand Cay, and Big Grand Cay. I've commented before that there doesn't seem to be much logic used in naming some of the islands. This is a good example whereby Grand Cay is much larger in land mass than Big Grand Cay. Go figure! The Grand Cays support a small settlement of people who are fishermen themselves or cater to the fishing tourists that frequent the area. There are no posh resort accommodations, cheesy tourist boutiques, or fashionable restaurants. You would only come here if you wanted to fish, and most people do that all day, every day, weather permitting. Cruisers stop here to fish too and be with other cruisers of like interests. 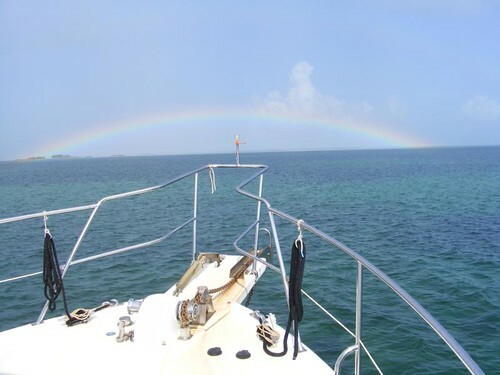 The offshore reef is close to the anchorage, so it is easily accessible for bottom fishing, trolling, snorkeling, and spearfishing. There are a lot of shallow water rocks and rocky bars in the vicinity that support big populations of lobsters. We've seen some areas under rocks so packed full of lobsters there wasn't any room for fish. We always miss out on a lobster feast since lobster season doesn't start until August 1, and we need to be back to Florida before then to prepare for the rest of hurricane season. The white sandy Wells Bay beach is about a mile long. It's a great place to get some good walking exercise, especially if you choose to walk in the really soft sand and have your calves get stretched to the max. It's not the best beach for beach combing since the water is shallow and sandy with minimal wave action so not much gets washed up. There are other small cays in the area with some little beaches so you just have to be patient and hunt regularly to find “treasures”. 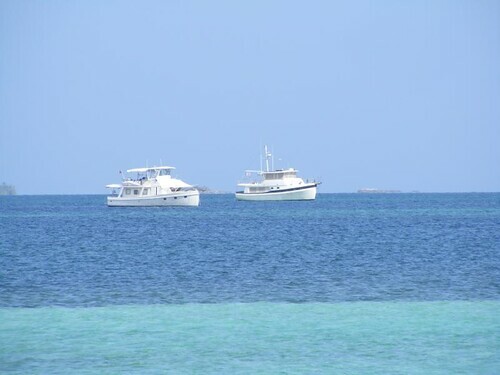 You can snorkel in the anchorage, and if you are patient and just pay attention, you will see some interesting sights. I saw one hole that had 3 compartments containing a lobster, eel, and stone crab. I saw locals regularly collect conch, and we picked up some nice shells on the beach leftover from someone making conch salad on Bahamian Independence Day, July 10. The locals had a big beach party, but no one invited us. 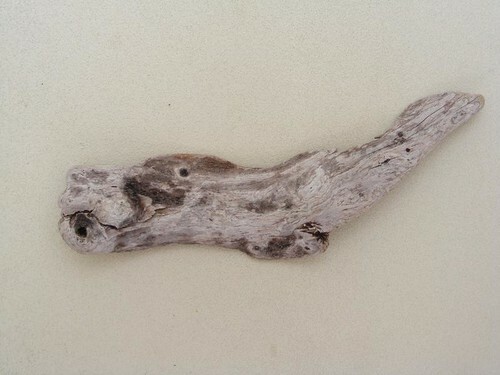 If you've followed the other blog posts, you will know that Eddie and I are always on the lookout for pieces of driftwood, especially those that resemble something. We both have the “vision”, and this photo is another check to see if you do too. If you can't see that this is obviously a whale, you don't have it! Early one morning Wayne and I took Ursa for a walk on Wells Bay beach. We discovered the remains of a hawksbill and loggerhead turtle on the beach that were obviously killed the day before. I had seen 3 locals on the beach for a long time, but I couldn't figure out what they were doing. They took all the turtle meat, but left the shells floating in the water. The hawksbill turtle is so beautiful, with intricate patterns on a shell that has pretty, spiked edges. The loggerhead shell is only interesting because of its huge size, about 3'. We are always sad to see the dead turtles, especially since the Bahamian government recently prohibited the killing of turtles. We've also seen a few turtle nests that have been dug up to collect the eggs. I found this oval, 12” long sponge. 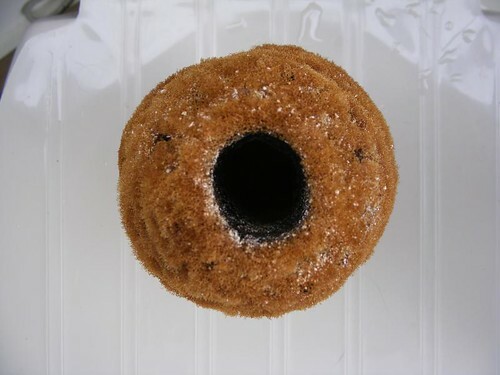 It is unusually symmetrical for a sponge, and clearly shows the numerous smaller incurrent holes around the outside and the one central excurrent hole in the top. 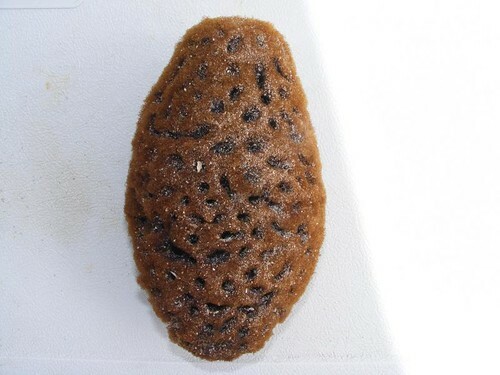 Sponges continually siphon water containing nutrients inward and expel the water back out the excurrent hole. With all the weather woes we've had to deal with, there has been ample time to do some beach combing and in addition to the sponge, we've collected lots of sea glass, other pieces of driftwood and shells. 9 out of the 15 days we spent anchored in Wells Bay, we had rain and/or a thunderstorm, most arriving between midnight and 3:00 a.m. That doesn't make for a peaceful night's sleep. We saw many clouds like this one. You can even see the lightning bolt and the veil of rain pouring down. These clouds are usually preceded by a very windy blast of cold air. The cold air feels SO good, but it is not worth it at the expense of the nasty wind. 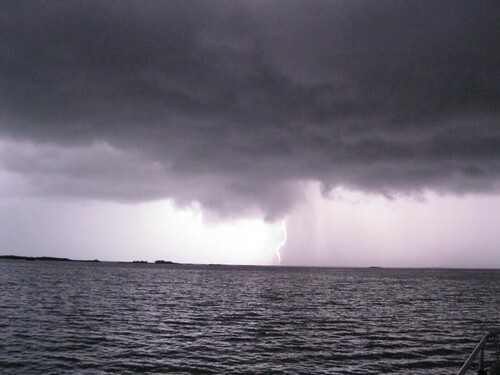 This photo, taken during daylight hours, gives you an idea how the bay gets kicked up when the squall line moves through. 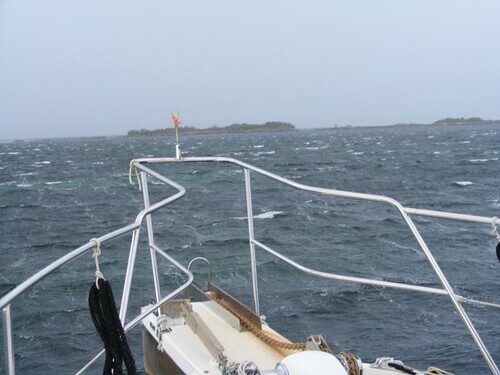 When its day time, we can at least have a better feel if the anchor is holding or be able to see if another boat or water spout may be coming our way. When the seas get kicked up at night, the neighborhood has a whole different feel; it is scarey. That's why we don't like to anchor close to another boat, especially in Wells Bay which doesn't have the best holding. 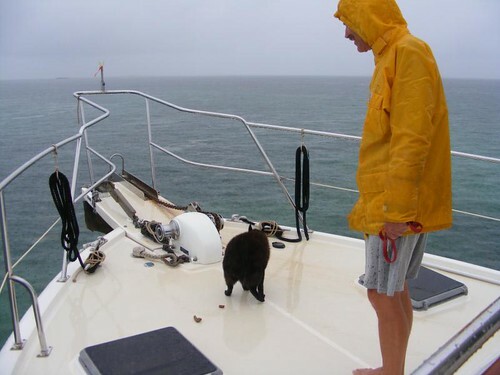 One day we saw one of the little local boats with 3 people aboard break down near shore right before a heavy downpour. They kept trying to work on the motor, but finally gave up and tied the boat to some rocks, which gave it a good beating. When the storm let up, they tried pulling themselves along the shore. We couldn't lend assistance because our dinghy had a steering problem. We tried calling people of the local settlement on the VHF, but no one would answer. After 4 hours, they were finally able to hail down another local and get help. Ursa feels best when she keeps on a regular schedule, for input and output. That means pooping in the rain, and on this cruise, she has done that quite a few times. I'm always glad when we make it through another storm unscathed and at least are treated to a pretty rainbow and time left in the day to be able to do other things. The other things don't just include fun activities and socializing. We always continue to have our regular share of maintenance issues. The day after I remarked how great the freezer was working, the temperature started going up. We have a lot of frozen vacuum packed fish, but the ice cream was getting soft, and we were in a crisis state. Wayne could only make guesses as to how much gas to let in or out of the line depending on how the temperature was moving or if the line was freezing up. It took several days, and just luck, to finally stabilize the freezer again. It may need additional work after FLUKE gets hauled. Shortly before we left Florida, Eddie had scavenged an old sail in good condition from the municipal marina. We cut it up and had the edges sewn and grommeted so that we could hang it over the boom and use it to shield the upper deck from the direct sun. That also helps keep the main salon much cooler. We think it turned out well, both functionally and aesthetically. Obviously you can guess that the heat has been as issue, and we are always looking at ways to cool off the boat better. Ursa was so hot and unsettled in the night that we went ahead and directly wired a 12V fan for her. Not only has it helped keep her cool, the fan noise masks the sounds of the thunder which makes her anxious. Some nights she jumps up on the bed table and waits for the fan to get turned on and then sleeps through the entire night. 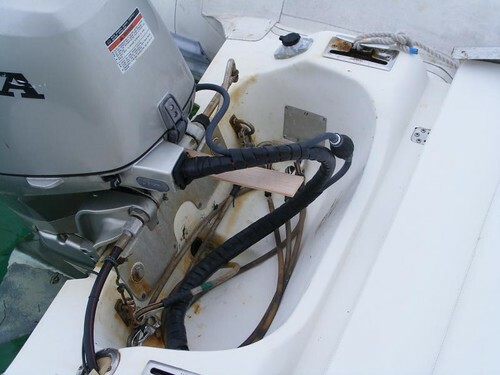 We have an ongoing issue with the engine fuel line loosing its prime, like it has an air leak. We discovered this when we went to start the engine after a few days of sitting idle, and it couldn't start because it was starved for fuel. Eddie has had to manually pump the fuel filter to force fuel into the line before each start. We have had a mysterious residue (presumably from a mist) in the engine room that we think might be tied to the problem, but we can't find an actual leak anywhere. That is on the list to troubleshoot. The guys had to change the raw water pump on the generator. Right about that time, Eddie noticed that one of the alternator brackets is cracked; we don't know how long it has been like that. However, we sure got paranoid wondering if the alternator would break off at a really bad time, like there is ever a good time for something like that to happen. I told you early on that we were having trouble with the dinghy steering. It progressively got worse, so the guys decided to screw on this wooden handle to give a manual assist to the steering assembly. It helped some, but about 3 days before we were going to leave, the wooden handle broke in half. Since we were down to our last gallon of gas for the dinghy we could have just called it quits, but our friends on EAGLE gave us two more gallons to hold us over until departure day. When Wayne wasn't fixing things or riding shotgun for our spearfishing expeditions, he kept busy baking. 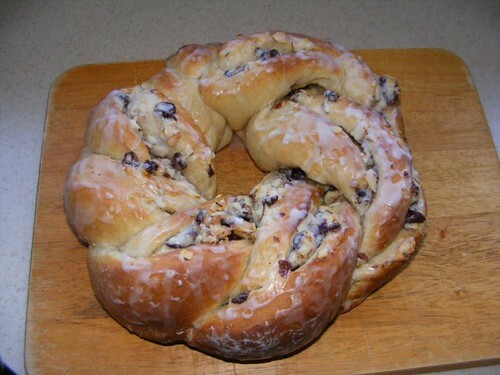 This cranberry almond breakfast ring was a big hit with the crew. He made a picture perfect braided semolina bread to share at a cruiser's group meal on EAGLE. Getting together with the other cruisers is a good way to exchange information about life aboard, anchorages, and experiences had. Everyone has something to add to the conversations. Carol and Bruce, from EAGLE, have been out cruising for years and are a wealth of information and seem to know everyone we run into. 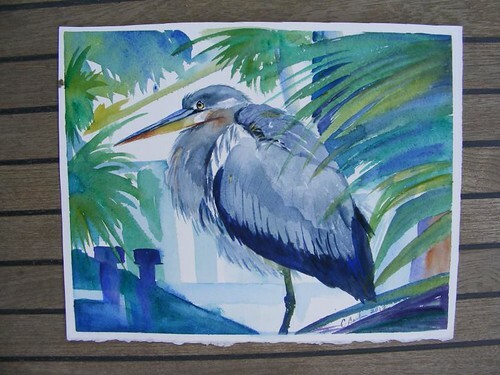 Carol likes to paint with water colors in her spare time aboard, and had a stack of paintings for us to look at. Imagine my surprise when she said I could pick out one to keep! Once we settled into life at Wells Bay, we went out spearfishing as much as conditions permitted. I had taken this photo of Eddie after he had gotten ready to go way ahead of time and was waiting for the tide to get slack. 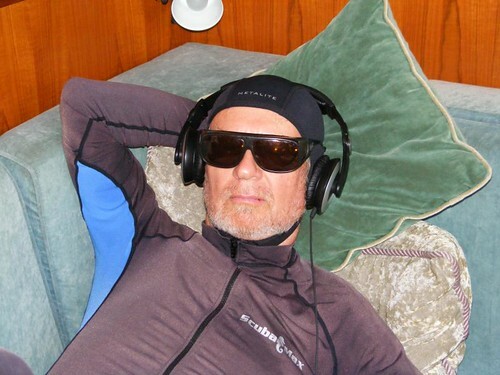 When I looked at the photo, I laughed because I thought with those headphones, glasses, and diving skin on he looked like one of those old Russian cosmonauts. 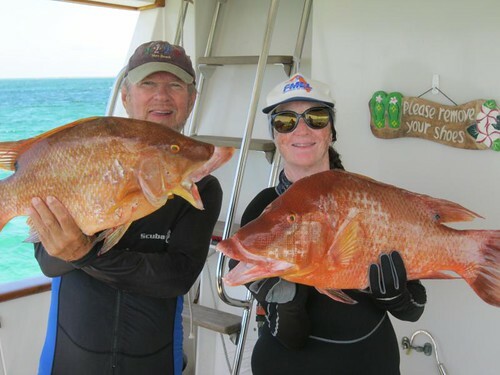 Our spearfishing outings aren't just about trying to catch the next meal. They are about visiting the underwater habitat and marveling about the myriad numbers of fascinating creatures of all sizes and shapes, the good, bad, and ugly. Being able to put a healthy, gourmet meal on the table is the prize. We never shoot anything we don't plan to eat, and we spend way more time in the water just looking and not getting anything. However, this photo shows our best day. 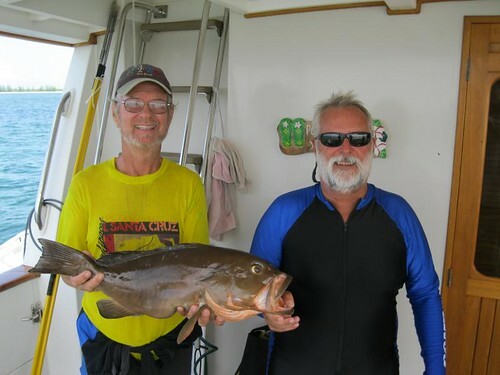 Eddie is holding his 8 pound hogfish, which is the biggest he's ever shot, and one we would say was a day's prize if I hadn't managed to spear the 12.5 pound one I'm holding. That is my new life record. Just finding two like this in the same day was a stroke of luck. We were also fortunate this year not to have to deal with sharks like we have in the past. I don't know where they all went, but on all our dives from our Wells Bay anchorage, we never saw one of the “bad” sharks, like the reef, black tip, bull, or lemon sharks that tend to be aggressive. Two separate times I gently bopped a big nurse shark with the blunt end of my spear when I thought it was getting too close to check me out at first sighting. The nurse sharks are very passive for the most part and just seem to want to check you out and then they usually go on their way so we don't worry much about them. One afternoon the FLUKESTERS went out for a dive with Carol and Bruce on EAGLE to a spot we had discussed but had never heard anyone diving at. We were on the third dive in the area, not really seeing much. Then Eddie spotted this big red grouper under a rock that you could see through from one side to the other. Eddie scared the fish through to Bruce's side and Bruce got a kill shot on the fish. 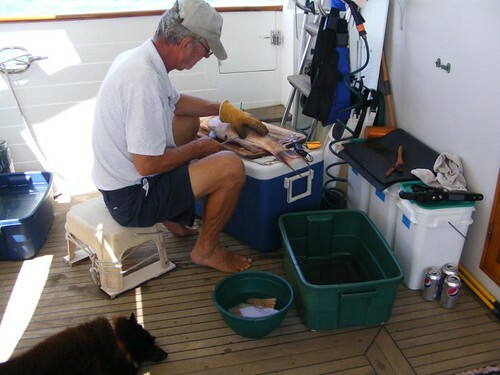 Eddie cleaned the fish, and we all got together for another gourmet meal aboard FLUKE and had plenty left over for EAGLE to serve another time. Eddie does a fantastic job of cleaning the fish we catch. He has a whole set of knives that he uses and keeps razor sharp. He saves scraps for Visitor and throws pieces to Ursa, who is always “guarding” the area when he is cleaning. If you put your hand near the fish that are to be cleaned, Ursa will growl. She won't let Visitor even step out into the cockpit. She has beat him up so many times, he won't even go near the door; he just stays back in the hallway and meows. Poor kitty. Eddie's fish cleaning had attracted a BIG barracuda to FLUKE. 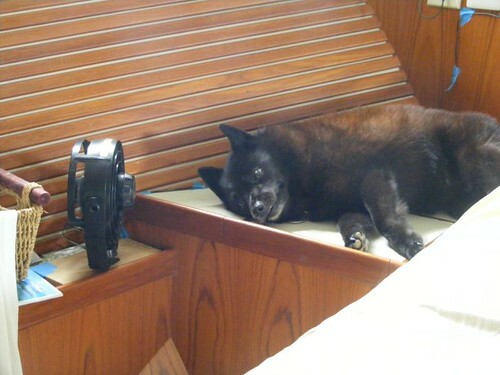 Any time something was thrown overboard, including Ursa's pee mat, the fish would come out from under the boat and check it out. One day, after a stormy night, I decided to snorkel out to the anchor to see how it was set. When I got in the water, the barracuda was there. Most of the time, they just swim away and keep a steady distance. This time, it followed way too closely with me, all the way out to the anchor (200'). I felt very intimidated by its actions and asked Wayne to come pick me up in the dinghy. He was making English muffins, so Eddie had to come get me and yelled at me the whole way back, saying I shouldn't have gone in the water in the first place. This is coming from the guy who had the shark bite the fish off the end of his spear! I always dread when the day comes for us to leave. I personally have mixed feelings about going back to Florida, but what ends up bothering me the most is Eddie's behavior. I thought it may be different this year since Eddie didn't have the usual enthusiasm for going in the first place although he seemed to really get into it as the weeks in the Bahamas progressed. When we told Eddie we would be leaving to go back in about a week, he started up. He gets real mopey and whines about having to leave, especially if we are hanging out with other people and having good diving adventures. So, nothing was different when the final day arrived and we went out for our LAST (emphasized by Eddie) dive. Even having ice cream for lunch didn't cheer him up. The melancholy had set in and continued on until we pulled up the dinghy and then the anchor at 3:00 p.m. to make our 4 hour run over to Mangrove Cay where we would anchor until 2:30 a.m. Eddie just stands out on the shady side of the deck staring off into the distance, like a puppy getting taken from its litter mates, mumbling about why we can't stay longer. Just one more dive, please! We had a stifling hot (87 degrees) evening at Mangrove, and I was actually glad to get moving at 2:30 a.m. in hopes that it would make the boat feel cooler. We had a light southeast wind behind us and lightly choppy, but fairly calm seas to everyone's pleasure. Visitor never threw up, so that tells you it was calm. We saw 3 ocean freighters and a cruise ship. A school of dolphins surfed the bow wake for quite a while, but I still haven't been able to get any decent pictures. While we trolled two lines, we didn't even get a bite on either line. I'm not complaining though, because we had so many other great fishing adventures. With the big push from the powerful Gulf Stream current we made over 10 KTS in speed for a while. However, since we were traveling on a northwesterly course we had to steer as much as 40 degrees off our actual heading to account for the current's northerly push. Despite spending over 12 hours at sea, the time seemed to go quickly. After we leave the ocean at Ft. Pierce inlet, it takes about another 2 hours to get to the Vero Beach Municipal Marina where we planned to unload FLUKE. That last leg of the trip just seemed to drag on for longer than two hours. We picked up a mooring line at 5:30 p.m. and thanked FLUKE for another safe crossing and bringing us happily back to our home port. 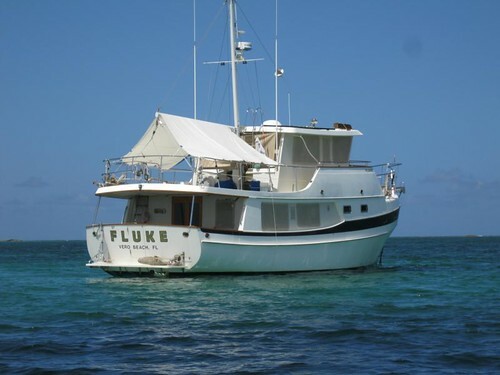 We will need a week to unload the boat and then FLUKE will be like a “fish out of the water” when she gets hauled out and stored on land for the rest of the hurricane season. Well, another adventure has come to an end. Thanks to all of you who have followed along with us, posting comments and letting us know you are being educated and entertained. We are kicking around some ideas for the next trip, date of departure still to be determined depending on where we decide to go. Wayne will put together a summary post for the 2012 adventure with our days out, miles traveled, fuel used, etc. If you want to know anything else, just ask and he can include that too.